Motion sensing is a rising technology that is transforming the way equipment interacts with machines and humans in the form of detection. Motion sensor is not only used in business and infotainment applications but also in routine activities in homes and other settings. The global motion sensor market is primarily driven by factors such as increasing application of motion sensors in automotive industry and consumer electronics industry. Motion sensors in the automotive sector are used in advanced driver assistance systems (ADAS), airbag deployment systems and security among others. The automotive industry growth in the developing nations of Asia Pacific can be attributed to rising domestic demand of cars having new technological advancements. Increase in purchasing power of people, improvement in the global economic scenario and the requirement of vehicles are boosting the demand for automotives, globally. Due to growth of the automotive sector, the demand for motion sensors will increase as many luxury vehicles are introducing large number of motion sensor products. Moreover, advanced hybrid and electric vehicles extensively use motion sensors. Based on types, the motion sensor market is segmented into MEMS magnetometers, MEMS accelerometers, MEMS gyroscopes, ultrasonic sensors and sensor combos. MEMS accelerometers garnered the maximum revenue in 2014. MEMS accelerometer motion sensor is used to detect earthquakes and is also used in detecting medical devices such as artificial body parts among others. MEMS magnetometers are generally used for purposes such as calculation of the magnetic material. Based on the various technologies, the motion sensor market is segmented into infrared sensor, microwave sensor, tomographic sensor, ultrasonic sensor and others. Infrared sensor garnered the maximum revenue in 2014. Infrared sensor is further sub segmented into passive infrared and active infrared. Active infrared dominated the market in 2014 and expected to retain its dominance during the forecast period of 2015 – 2023. Microwave sensor held the second largest market after infrared sensor in 2014. In terms of application, the global market is segmented into industrial , automotive , consumer electronics, fitness and wellness, health care, aerospace and defense and others. Industrial application is further segmented into lighting controls, service robotics and fire alarms and smoke detectors. Consumer electronics is sub segmented into gaming and entertainment, wearable devices, smartphones and tablets and others. The sub segmentation of automotive applications market includes advanced driver assistance system, airbag deployment system, security and others. Investment in research & development and new product developments is estimated to contribute to market growth over the estimate period of 2015 -2023. Additionally, rising popularity of wearable technology is anticipated to boost the demand of the consumer electronic sensors industry. Moreover, Motion sensor devices are used to monitor the activity in the immediate vicinity of the car. It is also used in automotive applications for a security system to monitor the activity outside the car. Based on the geography, motion sensor market is segmented into North America, Europe, Asia Pacific and RoW. Among all the regions, in terms of revenue, Europe held the major market share, accounting for 43.2% in 2014, followed by North America. This trend is anticipated to be the same over the estimate period. Major semiconductor companies and equipment manufacturers in Europe are focusing on business expansion across the region and setting up new plants for increasing their production capacity. The motion sensor market in Europe is anticipated to rise with its rising applications in consumer electronics such as smartphones and tablets among others. Asia Pacific is expected to be fastest growing among all others regions. Asia Pacific is also a lucrative market for consumer electronics and industrial application which in turn, is fueling the growth of the motion sensor market. Key players profiled in this report include Robert Bosch GmbH (Germany), Honeywell International, Inc(U.S.), Microchip Technology, Inc.(United States), Murata Manufacturing Co. Ltd.( Japan), Invensense Inc.( United States), Memsic Inc.( United States), Kionix Inc.(U.S.), Analog Devices, Inc.(U.S.), NXP Semiconductors N.V.( The Netherlands) and ST Microelectronics(Switzerland) among others. Motion detecting is the new innovation that is bringing an extensive change in security frameworks in business as well as home settings also. This is on the grounds that motion sensors can identify motion of living or non-living items that are inside the sensor's range. Motion sensors are indispensable in savvy floodlights, home control, robotized lighting control, and security frameworks among others. Motion detecting is a rising innovation that is changing the way hardware communicates with machines and people as recognition. Motion sensor isn't just utilized as a part of business and infotainment applications yet in addition in routine exercises in homes and different settings. As per the technologies, the global motion sensor market is dominated by infrared sensors, which accounted for maximum number of shares in year 2014. 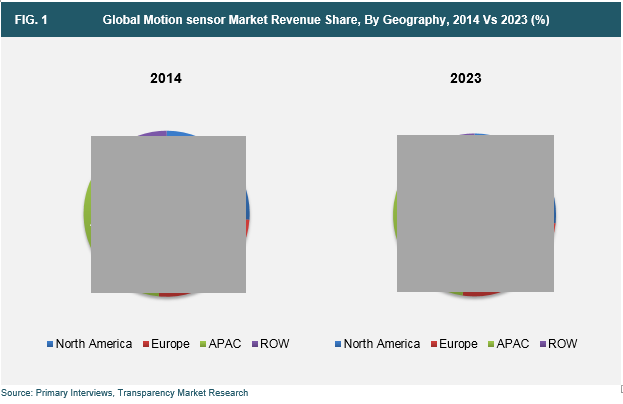 According to type, MEMS accelerometer motion sensor reigned the global market in year 2014 again, and is likely to keep its position intact within its forecast period from 2015 to 2023. The report offered herewith considers all the essential subtle elements and variables adding to the improvement of the worldwide motion sensor market, for instance, market figures, drivers, restriction, patterns, openings, market potential, portions, and land viewpoint. The report helps in understanding the market situation and aggressive scene for restorative training market, by displaying the key players, driving districts, business techniques, and extent of improvement. Increment in acquiring energy of individuals, change in the worldwide monetary situation and the prerequisite of vehicles are boosting the interest for automotives, all inclusive. Because of development of the car segment, the interest for motion sensors will increment the same number of extravagance vehicles are presenting vast number of motion sensor items. The worldwide motion sensor market is basically determined by elements, for example, expanding use of motion sensors in car industry and customer gadgets industry. Motion sensors in the car segment are utilized as a part of airbag arrangement frameworks and security, advanced driver assistance systems (ADAS), among others. The car business development in the developing countries of Asia Pacific can be credited to rising household request of autos having new innovative progressions. In addition, propelled mixture and electric vehicles widely utilize motion sensors. On the basis of geographical regions, the global motion sensor market is segmented into Europe, Asia Pacific, North America, and RoW (Rest of the World). Among every one of the areas, as far as income, Europe held the significant market share, accounting for 43.2% of in year 2014, trailed by North America. Significant semiconductor organizations and hardware makers in Europe are concentrating on business development over the locale and setting up new plants for expanding their manufacturing limit. The motion sensor market in Europe is expected to ascend with its rising applications in customer gadgets, for example, cell phones and tablets among others. However, Asia Pacific is expected to be the quickest developing among all other regions. Kionix Inc.(U.S.), Honeywell International, Inc(U.S.), Murata Manufacturing Co. Ltd.( Japan), Memsic Inc.( United States), NXP Semiconductors N.V.( The Netherlands), Robert Bosch GmbH (Germany), Microchip Technology, Inc.(United States), Invensense Inc.( United States), Analog Devices, Inc.(U.S.), and ST Microelectronics(Switzerland) are among the key players in the worldwide motion sensor market.